The Tablo DVR is an awesome all in one over the air recording and streaming solution. It is an excellent whole-house recording option for anyone who wants to take full advantage of their over the air antenna. This DVR allows you to record 4 shows simultaneously and up to 6 users can watch at one time. It comes in two configurations, a 2 tuner model and a 4 tuner model, depending on your household demands. The Tablo DVR acts more like an over the air media server that will record and stream your content to many different wireless devices. 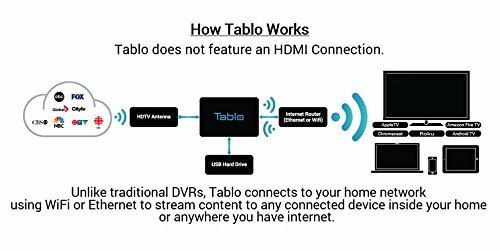 The Tablo does not have a traditional HDMI output to connect to your television. It will push the content to your wireless devices. You can watch live or recorded over the air TV on any phone, tablet or HDMI connected device like Amazon Fire TV, Android TV, Apple TV , Roku or Chromecast . You just need to install the Tablo app on your wireless device and you can watch live TV. The Tablo serves up content strictly over a wireless connection. For best results, you should have at least a 5 GHz 802.11n type router. Since all the content is recorded in HD you will need a router that can push the content at a fast enough bit rate. 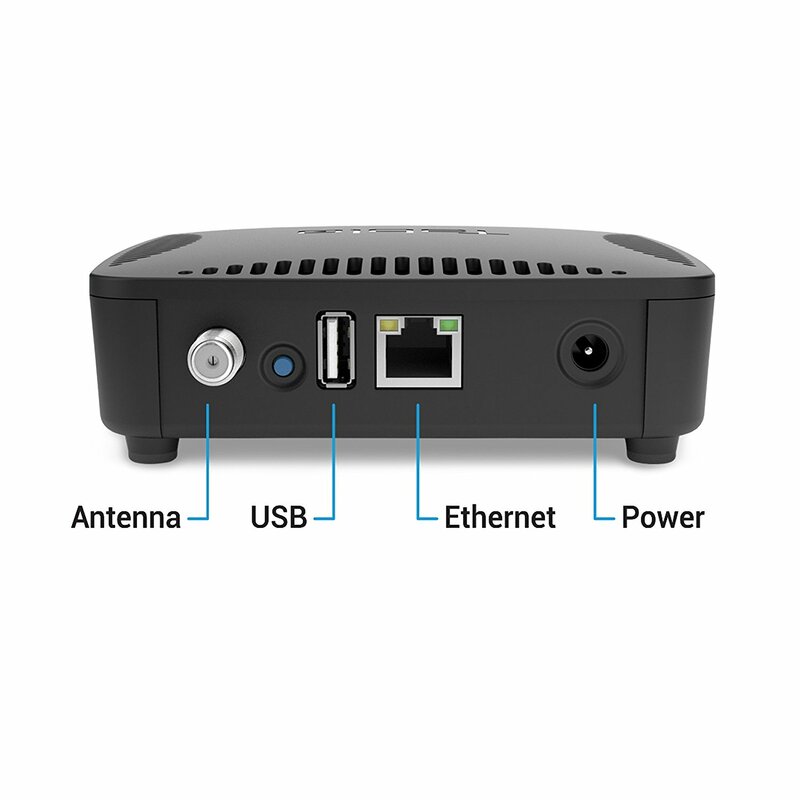 It does have wireless capability to connect to a wireless router but, for the best performance, you should have the Tablo DVR plugged directly into your wireless router with an Ethernet cable. This will allow for less buffering issues. The Tablo DVR will record all content in full high definition. It has 64 GB of internal storage. Allowing for up to 40 hours of internal recordings. A separate USB hard drive is required for additional recording. The Tablo DVR can support up to a 8TB external USB hard drive. They recommend using the Western Digital Elements USB 3 drive. They do offer a schedule recording service that will keep your recording guide up to date for a fee. The service will provide live TV data 14 days in advance and a smart recording feature that allows you to record by series, season and new episodes. It is not required, but it will make it easier to keep up with your recordings and what is currently on the air. Tablo TV has excellent support and a very active forum community to help you with any technical problems. The forum discusses the latest firmware upgrades and apps for Android TV’s, Roku, Fire TV etc. The Tablo TV team is consistently improving the software and announcing upgrades. They are always trying to improve the functionality and compatibility of the devices that it will work with. There are also discussions about Plex and Kodi integration. It is a very good sign of things to come with this device. Do you need help setting or choosing an HD antenna? I have written a how-to article. It will take you through the whole process. Click on the link below. The Tablo DVR is an awesome over the air recording device that the whole house can benefit from. Everyone can enjoy there own television program using their device of choice. With Tablo TV’s ongoing development, it should stay relevant for the foreseeable future. Setting up your antenna and getting the best reception possible should be the first step to cord cutting. This should be done before ordering any other equipment. This experience prepares you to make the best decisions concerning buying the other equipment. Consulting users at the Tablo Community website is a good place to help you through this process. Once you get you antenna right, the rest is easy. The Tablo Community was a great help in fine tuning my reception. I have whole house DVR and live TV wirelessly connected via Roku boxes to my living room entertainment center. The picture is better than when I had cable and even my wife loves it. Once we recoup our equipment costs, we will be saving $130 a month. We are very happy with it. I see primarily several issues tha new users have with the Tablo. They do not tune there over the air reception before they start connecting equipment. 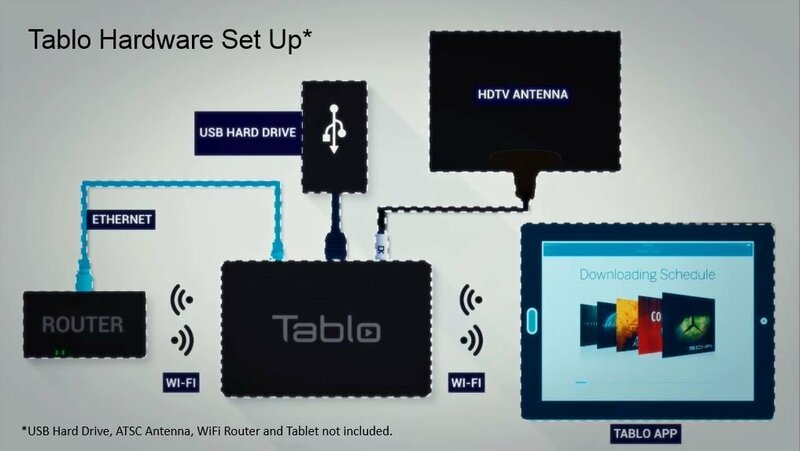 The Tablo is not good for channel surfers because of the delay between switching channels or functions and you need to adjust to the way the channel guide and other functions work. They are good when you get use to them. I user a multiport distribution preamp to route one port to the Tablo and one port to the TV antenna connection. That way if I have problems, I can use the tv remote to swith to the antenna, bypass theTablo and internet, and watch tv straight off the antenna on my primary tv. You are right making sure your antenna is properly set up is key before proceeding. Thanks for sharing your advice and experience.